A captivating photographic exploration of Mississippi's Gulf Coast. 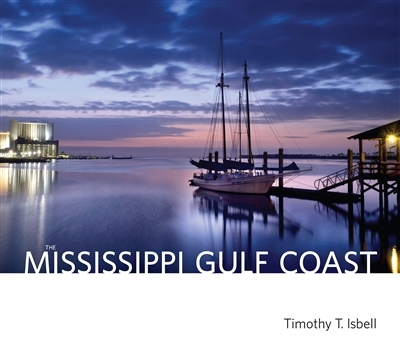 Through more than two hundred stunning photographs, The Mississippi Gulf Coast illustrates what visitors and residents alike love about the region--the sunrises and sunsets; the distinctive character of each town along the waterfront; the historic places; the traditional coast cuisine; and the arts, gaming, and watersports. Passing from the western part of the coast to the east, The Mississippi Gulf Coast will refamiliarize some and introduce others to the Coast of Bay St. Louis, Pass Christian, Long Beach, Gulfport, Biloxi, d'Iberville, Ocean Springs, Gautier, Pascagoula, and Moss Point. Through words and images, photographer Timothy T. Isbell provides a brief history of the area, from the first settlers to the waves of immigrants who have helped shape the character and culture of the region, and a reflection of the current state of the Gulf Coast. The Mississippi Gulf Coast has spent more than a decade recovering from the ruin left in the wake of Hurricane Katrina. During the earliest days following the storm, Isbell was sent out to document the grim aftermath of Katrina. Seeing damage everywhere, he became overwhelmed by the destruction surrounding him and soon wanted to see images of hope and recovery. It was at that point he made a promise to show the "true Mississippi Gulf Coast," an area known for its natural beauty and spirit. The beautiful photographs in The Mississippi Gulf Coast are a testament to renewal in the face of adversity. TIMOTHY T. ISBELL, Gulfport, Mississippi, is an author and freelance photojournalist. He was a member of the 2006 Pulitzer Prize-winning newsroom of the Sun Herald of Biloxi. He has been inducted into the University of Southern Mississippi School of Mass Communication and Journalism Hall of Fame and is a Knight Foundation/National Endowment of the Arts grant recipient for his photographic study of the Vietnamese people of the Mississippi Gulf Coast. He is author and photographer of Gettysburg: Sentinels of Stone; Shiloh and Corinth: Sentinels of Stone; and Vicksburg: Sentinels of Stone, all published by University Press of Mississippi.